Approaching our last destination late at night, we saw what looked like a fire burning on the sea as we flew into Koto Kinabalu, capital of Sabah (A Malaysian part of the island of Borneo). It was an off shore oilrig, and a sight that set the table of mysteries and atmosphere for the unknown we were to encounter. I didn’t take a picture of the oilrig from the plane at that moment, as the plane was bouncing around violently, although I wish I had had the presence of mind to record the exuberant and terrified screams that ensued. Mt. 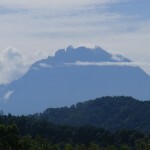 Kinabalu is known as the Mountain of Spirits and is a majestic presence in the area. The sounds of KK and Sabah were calm and more natural than the urban sounds of Seoul and Hong Kong, being out of a city and on the coast. We explored the secondary forest and coastline, looking into the bays that lead to the mangrove swamps. 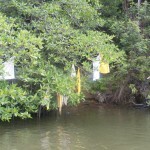 The swamps are mostly mangrove trees and a few islands. 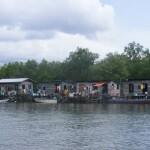 The people have evolved different houses for the places they live, houses on stilts here in the swamps, boat houses on the sea shore, long houses in the primary forest and so on. They live in the nature and with the wildlife that lives there too. We made our way in a small boat through the mangrove, and came after a while to a burial site where the family bring the deceased in a boat to this island. Instead of head stones or plaques, type of person: young, old etc is commemorated by different coloured cloth. 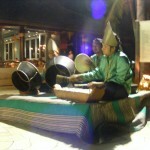 Traditional instruments – gong or talempong, drums – tambor and gendang, and 9 note metallephone like a simple version of the Indonesian gamelan instruments. The recording was done in a rather reverberant hotel foyer, and with out the rest of the band. 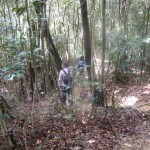 Exploring the secondary forest and courted by the cicadas, squirrels and snakes. 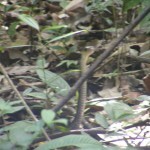 Luckily our guide alerted us to this Spitting Cobra, a dangerous snake, obviously put out by our tramping through his territory. A member of our party had a noisy camera, and I wondered what this creature thought of these digital beeps. We flew home over miles of unknown terrain, back thought the night and day, altering watches, changing daily diets to a chilly UK. 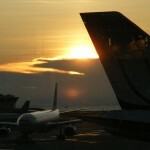 Even though I am now many thousands of miles away, and months down the line from my visit, the recorded moments in sound fill my head with my travel experiences: the substance of the ground under my feet, the physical spaces around me at the time, the sun on my back and even the exotic smells.